CHASING FOOD DREAMS: Kampachi by Equatorial, Jaya33: An Haute Japanese Affair! Kampachi by Equatorial, Jaya33: An Haute Japanese Affair! Kampachi Opens in Petaling Jaya! Japanese cuisine aficionados will be pleased to know that Kampachi by Equatorial has just added a new outlet in Plaza33, the new extension of Jaya33 in Section 13, Petaling Jaya. Kampachi, the country’s most established and highly regarded Japanese restaurant is set to cater to the gourmands of PJ with its haute Japanese cuisine. 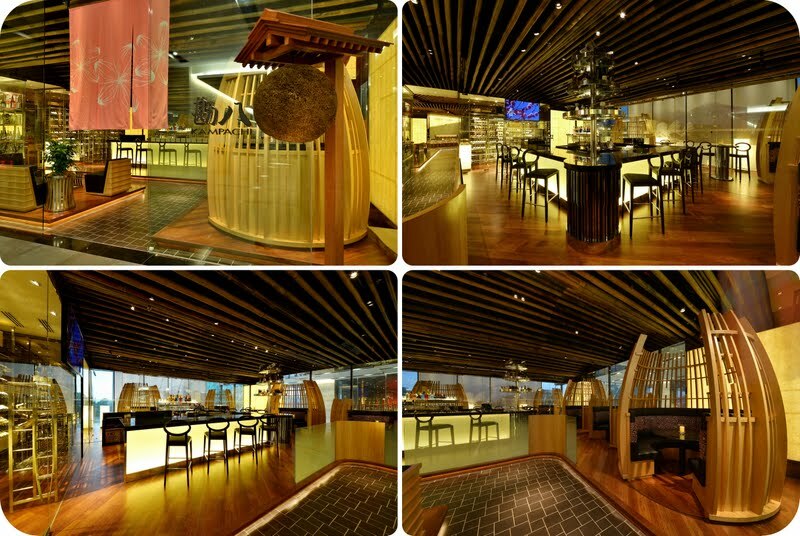 A class of its own, walking into any Kampachi outlet delivers an everlasting impression! This new one is equal to its others in Pavilion Kuala Lumpur and Troika, grabbing your attention at every corner of its surrounding. Boasting a seating capacity of 198 persons, there are two distinct zones at this outlet. Upon entrance, a stylish bar sets to mood with a circle of unique wood pods surrounding it. The pods feature rotating capability for added privacy or to face a neighbouring pod for a bigger party. Kampachi takes pride on its list of premium sakae as the restaurant stocks one of the largest varieties of specialty Japanese sake. Sakae lovers will be able to enjoy some hard-to-find ‘cult’ sakes from exceptional breweries that are made available in Malaysia, exclusively at the Kampachi. The main dining area is spacious and decked out in Zen elements like wood, handmade papers, unique tiles and more. Every detail is well thought off and calculated to a tee. There is a teppanyaki bar for those who seek live teppanyaki action or simply choose a seat at the gorgeous sushi bar. It’s simply amazing how the designer manage to balance all the designs of the interior using different patterns and materials everywhere. The restaurant also features three gorgeous private rooms with automated sliding door. Choose from different design theme and one particular one even has a special show kitchen concealed by moveable panel where guests can watch live kitchen actions. They certainly went all the way out for the contemporary and sophisticated interior design! 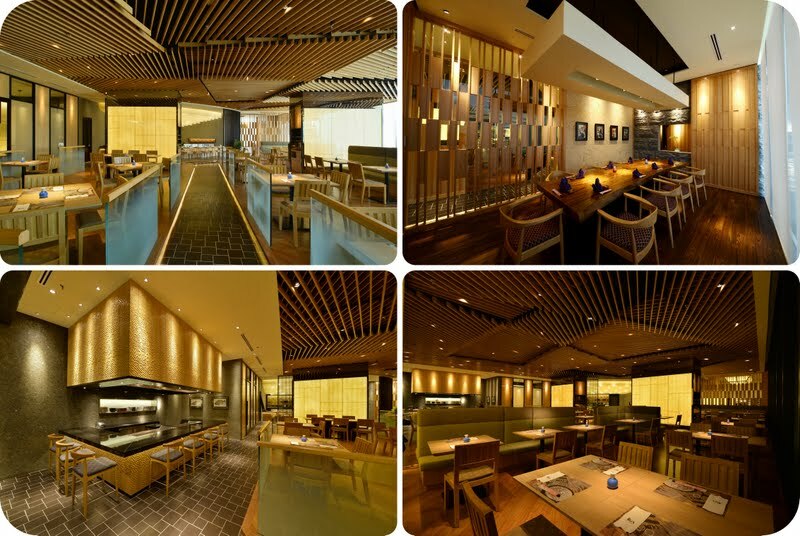 With many accolades under the group, Kampachi is renowned for serving its finest Japanese cuisine in the country. That evening, dishes specially prepared by Executive Chef Looi Weng Leong took dining to new heights. Going in for the finest, Kampachi showcase quite a few ingredients brought in from Japan. From the simplest ingredient of tomato downright to the highly prized melon, the impressive flavours and textures are deeply imprinted in my mind. Using a unique imported Ameera tomato grown in the Shizuoka prefecture, we didn’t understand what it was all about till we had a bite. The fruit is so versatile in flavours and textures. Instead of the usual tomatoes we get here, Ameera tomatoes live up to its fruit category. Utterly sweet with a nice crisp texture, it’s really juicy and fruity. Served cold and skin removed, the sweet tomato is paired with crab meat and edamame in a thick dashi sauce before being crowned with sea urchin. The fruity sweet sensation refreshes the palate while the creamy uni added contrast to the overall textures. Chef Looi highly recommends the tomato as a dessert as well. A fish like no other, this one flies through the air above the water. One of the most intriguing species in the sea, the fish is more famed for its roes in most Japanese dishes. As it was in season, we were lucky to be able to try this at Kampachi. We watch in live action as Chef Looi deftly prepares the sashimi right before our eyes! The flying fish has a fairly strong flavor with hints of creamy notes. It’s soft texture is very enjoyable. To enjoy its full potential, we were encouraged to try it solo first before adding freshly grated wasabi, ginger and onion. This hard-to-catch fish is available for RM120 per fish. Originated from the seas of Australian, this fresh whole green-lipped abalone is first steamed with sake, kelp and radish before being sautéed and seasoned. Thick and fairly firm, the abalone has nice smoky and juicy flavours. Coupled with sautéed buttered Shimeji mushrooms, the dish exudes wholesome and earthy flavours. It’s RM98 per abalone and is even available as sashimi. Feel like splurging? This one certainly takes the cake! I like how Kampachi brings in authentic Japanese ingredients to tease our senses and to also educate our palates. After a rich meal of fruit, fish and abalone, Himi udon is simply perfect for the soul. The thin flat udon noodles are steeped in a soothing sweet and savory broth. Minimal accompaniments showcase the original texture of the udon as one slurps it up. One is consoled by the bowl of udon in pure contentment! The exquisite and lavish muskmelon from Japan is also available here in Kampachi. The king of melon is utterly divine with sweetness like no other and a smooth and almost creamy texture. What a way to end a meal! A wodge of the meron will set one back with a hefty tag of RM60-RM75. Our omakase dinner cost RM280 per person for the whole set above or one can also order them a la carte. Besides the menu, Kampachi is proud to kick off its famed Sunday Buffet. Priced at RM118++ per adult and RM68++ per child, we heard it’s fully booked till July! Kampachi by Equatorial at Jaya33 is set to impress and impress us is what it did! Oh gosh!!! Authentic Japanese seating! Problem is if I get down on the floor, they will need a forklift to get me back on my feet again. LOL!!! We have a Kampachi here too, at Equatorial Hotel as well, i used to be a regular there for their buffet, but the prices have increased tremendously since then.... i wonder if they have any new promotion like this in Penang ? wah, RM120.00 / fish, RM60.00 / pcs of melon, what a luxury meal! Fantastic post! Love your fab pics and food description. I can tell you truly savoured every morsel! OOo...i like the fresh catch!